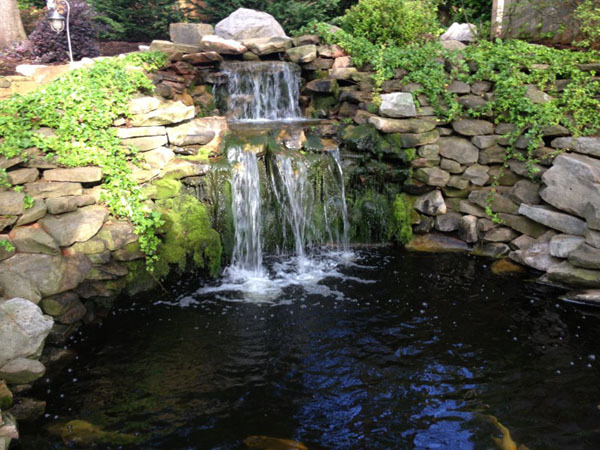 This backyard pond design was planned with primarily one thing in mind and that was to have Koi in it. Everything about this pond has koi written all over it. With a waterfall design added to this pond was not only for the visual effect, but to also provide plenty of oxygen for the fish. Koi fish need plenty of oxygen sometimes we will also install bubblers in pond to help provide more oxygen. It is also very important to run the pond 24hrs per day. Some people think that a pond pump does not need to be run at night time but that is the farthest from the truth. Not only does running the pond all of the time keep the koi healthy but it also helps in preventing bad bacteria from growing due to lack of oxygen.